U.S.-led coalition and Afghan forces clashed with Taliban fighters and called in an air strike in southern Afghanistan, leaving 24 suspected militants dead, while three more died in an ambush in the west, the coalition said Thursday. The joint forces battled Taliban fighters for seven hours after they were ambushed while patrolling Wednesday in the volatile Sangin district of Helmand province, a coalition statement said. Acting on intelligence of militant activity involving 40 Taliban, coalition forces then called an air strike, the statement said. The battle left 24 militants dead, while two coalition soldiers suffered minor injuries and are in a stable condition, it said. NATO and Afghan troops launched their largest-ever offensive last month in southern Afghanistan to flush out Taliban militants from the northern tip of opium-producing Helmand province. In western Herat province, U.S. special forces and Afghan troops clashed with insurgents disguised as police officers manning a makeshift checkpoint, leaving three suspected militants dead, the coalition said Thursday. The militants, wearing fake police uniforms, opened fire on the troops as they approached the illegal checkpoint in Herat's Shindand district on Wednesday, the coalition said in a statement. The patrol returned fire, killing three militants and wounding another three, it said. Troops have confiscated over 100 fake police uniforms and more than a dozen false identification documents in Herat province since Tuesday, the coalition said. 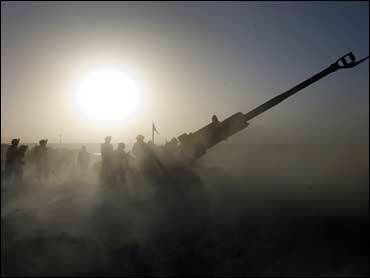 On Tuesday, Afghan troops searched a compound and discovered 18 rocket propelled grenades and 27 AK-47 weapons. The compound's guard later confessed that he commanded more than 100 Taliban fighters, the coalition said. In Kapisa province, 40 miles northeast of Kabul, police and Afghan soldiers were preparing an assault on a group of militants in Tagab district, said provincial police chief Gen. Mohammad Eawaz Muzlim. Authorities have been battling militants in the area since Monday, leaving 10 suspected militants dead and six policemen wounded, said Kapisa deputy police chief Jalal Khan.